2 leeks, roots and dark greens removed. I start my prep by finely dicing my leeks (save half of one to cook with the lentils! 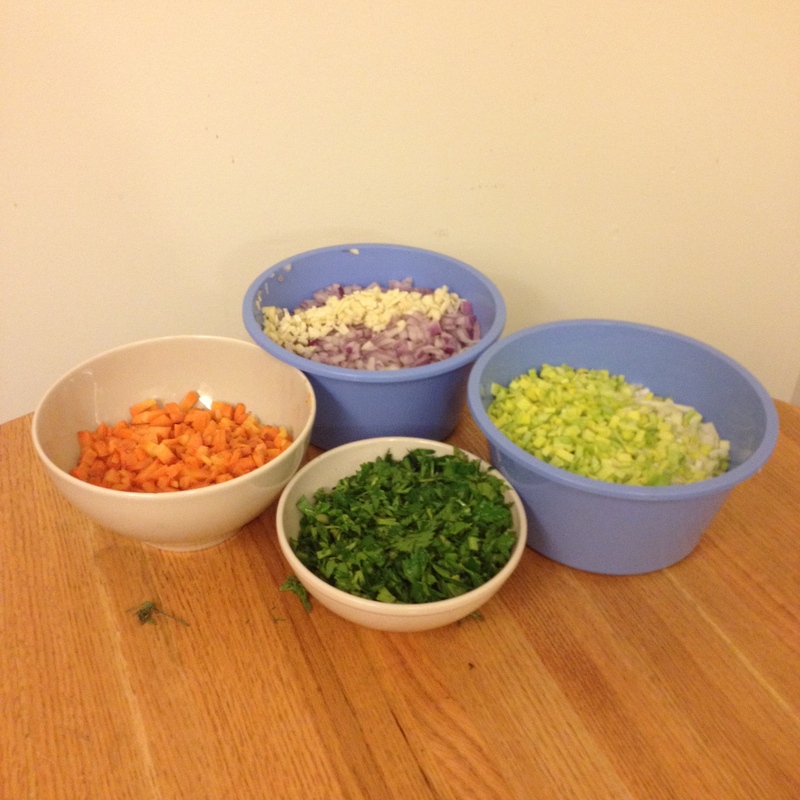 ), onions, carrots, and parsley because it takes me a while, but if you are faster (or have help! 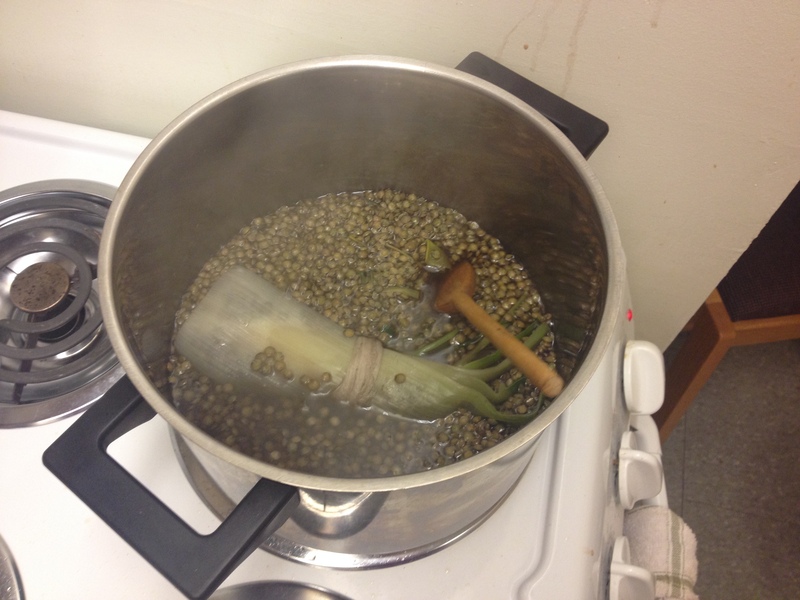 ), you might want to start by cooking your lentils and dice your vegetables while they are on the stove. Here’s the beautiful product of my labor – making good use of the fluid receptacles Mom got me from the hospital! As you can see, this is a lot of vegetables – perfect to feed me for a long week! 😀 I like to dice pretty finely so that the texture is relatively consistent with the size of the lentils. I also minced some garlic and threw that in, because how could that be a bad thing? 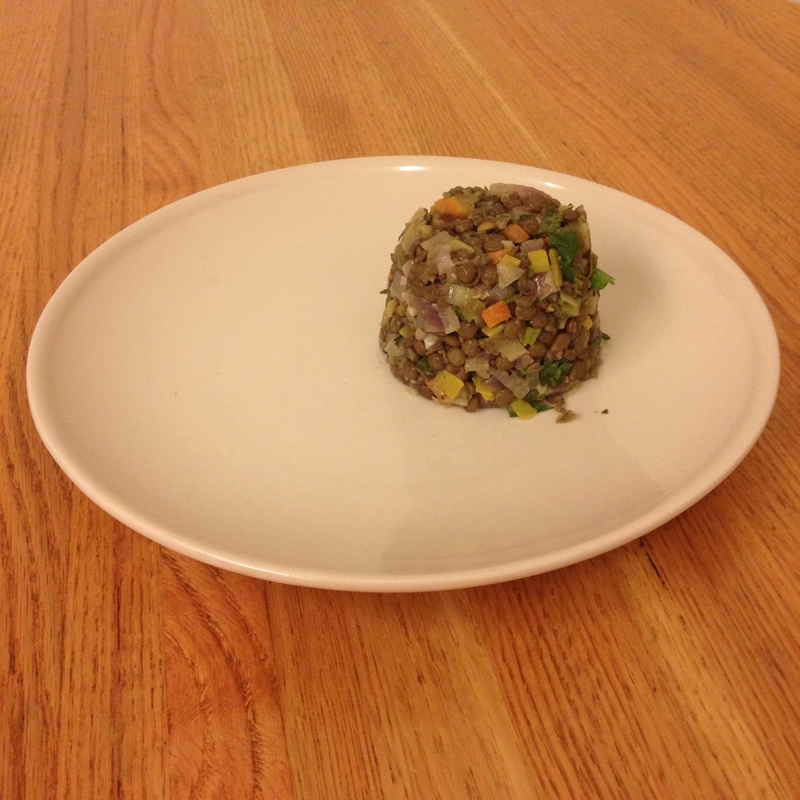 While you’re dicing your vegetables, you will want to start cooking the French lentils. Cut a leek in half and tie it to some parsley stems with some twine or something else that won’t impart anything harmful into your food. I used a strip of cheesecloth. Put in a pot with the lentils and, optionally, a clove or two of crushed garlic and a bay leaf, and cover with a few inches of cold water. Cover and bring to a boil over medium-high heat (about 10 minutes). When the water starts boiling, reduce to a simmer on medium-low heat and uncover. Stir occasionally for the next 15 minutes. Then, add some salt, stir again, and continue to simmer for about 10 minutes, until lentils are just tender. Lentils cooking with leeks, parsley, and garlic. I felt very fancy. I’ll admit – the last time I made this, I accidentally tied my carrot greens to the leeks and cooked my lentils with that. I also chopped up carrot greens instead of parsley and was really confused by how fibrous and non-aromatic they were, which fortunately led me to the realization that I was using the wrong greens, oops! When your lentils are done cooking, drain them and set aside. You’re also going to cook all those fun vegetables you chopped up (minus the parsley!) on medium heat in an amount of olive oil appropriate to the amount of vegetables you’ve chopped (a couple tablespoons will probably suffice, since after a couple minutes you’ll find some of the water cooks out of the vegetables and prevents them from burning). 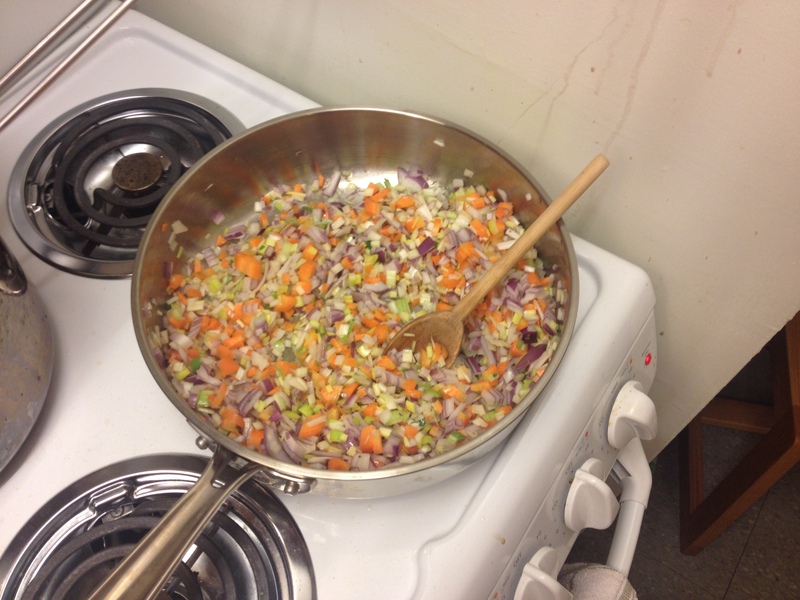 Heat the oil in a large sauté pan until shimmering, and add leeks, carrots, onions, and garlic. Cook until onions are translucent and everything is just tender, about 5 minutes. Here are my vegetables cooking from the first time I made this. Note that I seriously stepped up my veggie game for the latest batch. After these are cooked, combine with your lentils and fresh parsley, and stir it up! Add 3-5 tbsp (or more!) of vinegar to taste, along with salt and pepper. CHOW calls for red wine vinegar, but I used raw apple cider vinegar since I have it on hand, and it was delicious! Here is the end product! I’d love any suggestions on how I should fill the rest of the plate! A friend of mine (who doesn’t usually like vegetables [ironically, she is a vegetarian]) didn’t like this on its own, but it went great with some rosemary crackers she had on hand. Note that this recipe makes a LOT of lentil salad, and I encourage you to play with the amount or ratios of ingredients, which are pretty flexible. I loved making this, it’s relatively quick and I could find almost everything I needed locally at the Union Square Farmer’s Market which was awesome! It’s super crunchy and fresh tasting and packs a ton of fiber and protein. It’s also great for me because it keeps well, is easy to throw in a container to bring to class or work, and tastes great at virtually any temperature – hot, room temperature, or cold. Yummmm! I would probably fill the plate with greens, either fresh or sautéed kale. Or what about steamed broccoli with ghost pepper salt?